Nikon Nikkor AF-S 14-24mm f/2.8G ED review: A very impressive ultra-wide performer on the Nikon D800? With a constant maximum aperture of f/2.8 and minimum focal length of 14mm delivering a truly expansive horizontal angle of view of 104-degrees, this lens is the widest rectilinear zoom lens in Nikon’s range. With a huge convex front element, ED glass and as one of the first to premier the firm’s new Nano Crystal coat technology, the lens is still one of the most sought after models in the firm’s range. Even when fitted on a DX camera, or when used on a FF bodies using the DX crop mode, the lens is the equivalent of a 21-36mm and still a very useful range to have. Taking first place in our ranking when mounted on the Nikon D800, the AF-S Nikkor 14-24mm f/2.8G ED is an outstanding performer. 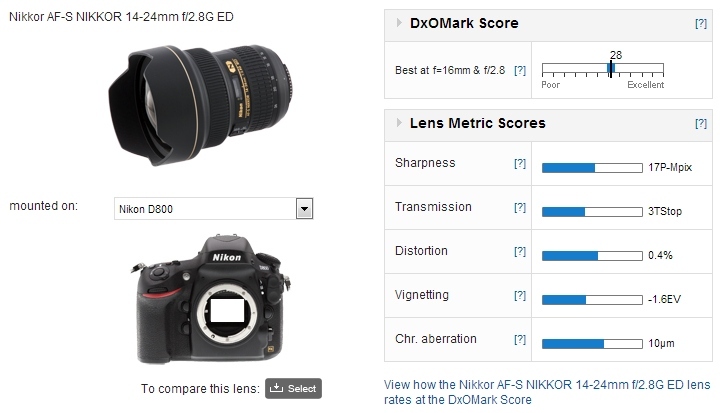 With a DxOMark score of 28, the Nikon AF-S Nikkor 14-24mm f/2.8G ED performs very well for an ultra-wide zoom. 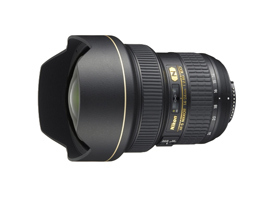 Mounted on a Nikon D800, it performs at a similar level to its stable-mate, the AF-S Nikkor 24-70mm f/2.8G ED. Again, given the extra-ordinary angle of view of this zoom, at 17p-Mpix the Sharpness score is very good. You would expect the distortion to be an issue with a zoom like this but at averaged at 0.4% (actually 1.1% at 14mm) it’s very low. On the flipside, vignetting at 14mm is quite high. Our averaged score is -1.6EV but wide-open at 14mm this is was quite significant at -2.4EV measured across the field. Between 14-16mm, the lens also has quite high-levels of chromatic aberration, which may be noticeable at times in the corners of the frame. 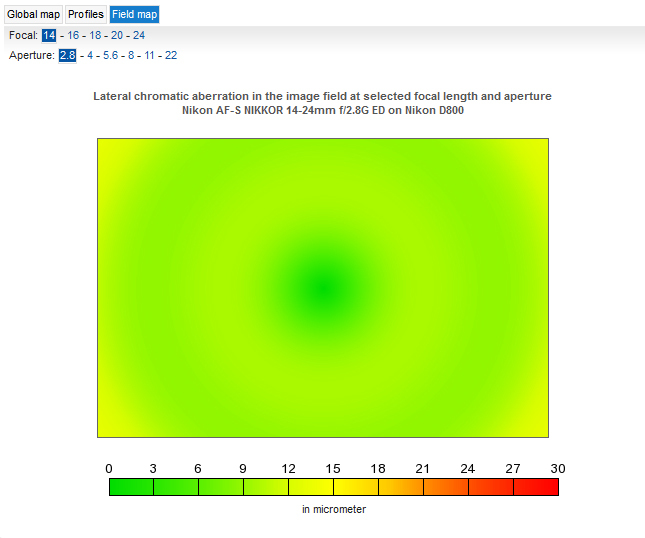 A concentric ring of chromatic aberration around the centre of the image field was also apparent in our tests, but may be more difficult to see in photos. Overall, however, the image quality is very high. 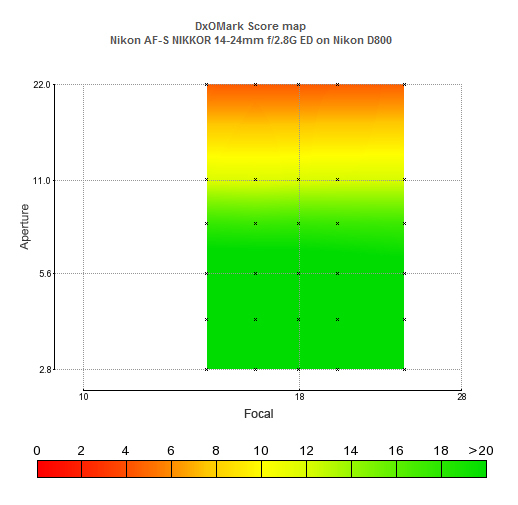 An average of the metrics, the DxOMark score map shows that image quality remains high to f/8 where the effects of diffraction can be seen to begin to degrade the image. 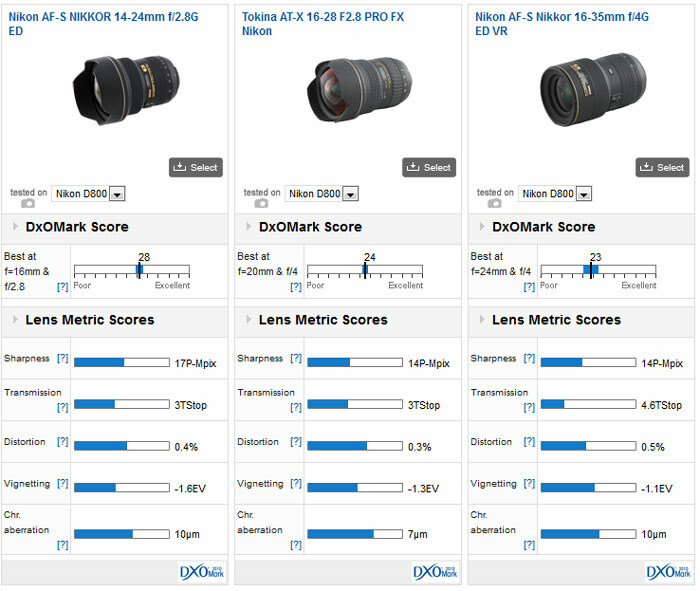 With an overall DxOMark Score of 24, the rival Tokina AT-X 16-28mm f/2.8 Pro FX is still some way behind the wider, more extreme AF-S Nikkor 14-24mm. 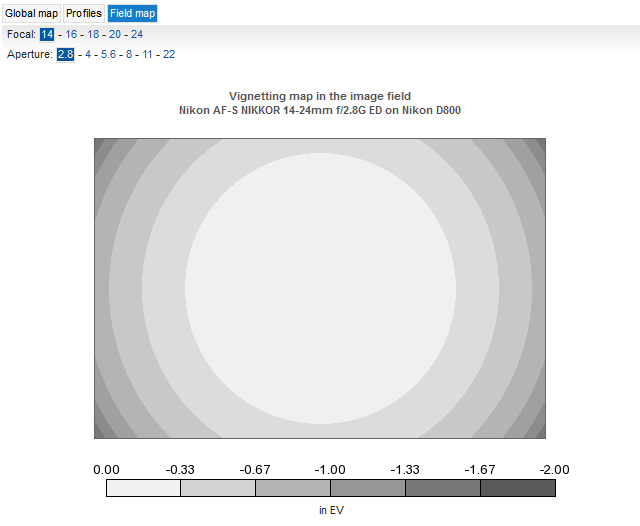 The Nikkor’s higher sharpness levels can be put into context here. 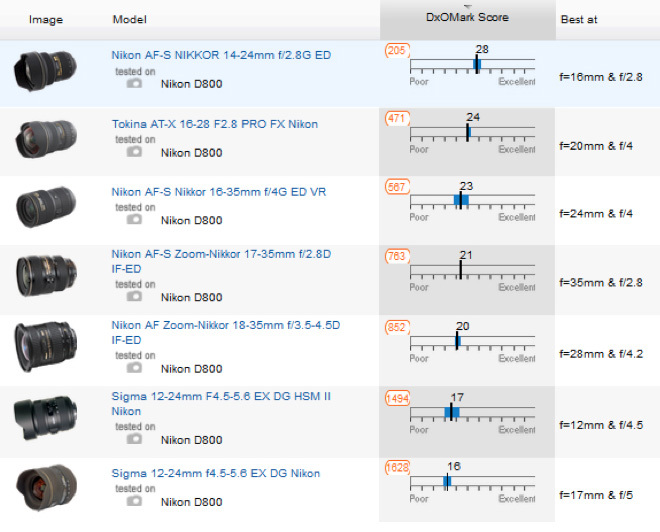 Even the firm’s newer 16-35mm f/4G ED model can only match the Tokina. At f/2.8 the Nikkor 14-24mm is superior to the Tokina at f2.8, and is the only ‘fast’ zoom that compares favorably with a prime. Although the Tokina is a fine lens, wide-open it’s some way behind the 14-24mm. The loss of sharpness from the centre, a problem with most wide-angle lenses at maximum aperture, is well controlled on the Nikkor 14-24mm, better even than the firm’s newer 16-35mm VR model. 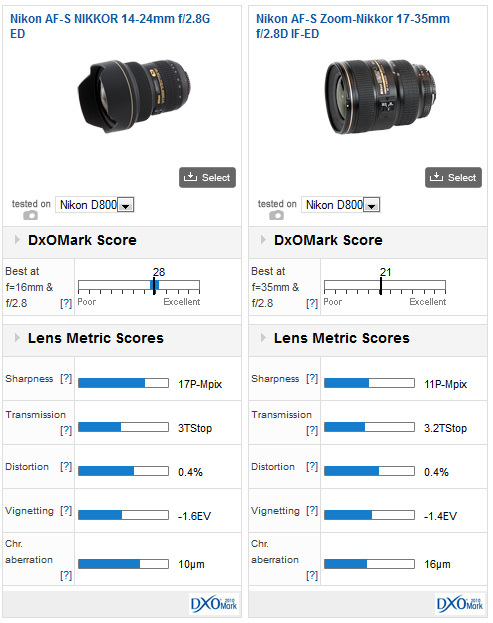 As for Transmission, the Nikkor 14-24mm is very consistent, with the exception of some light loss towards the longer end of the zoom range, where it was measured as T3.2 at 24mm. 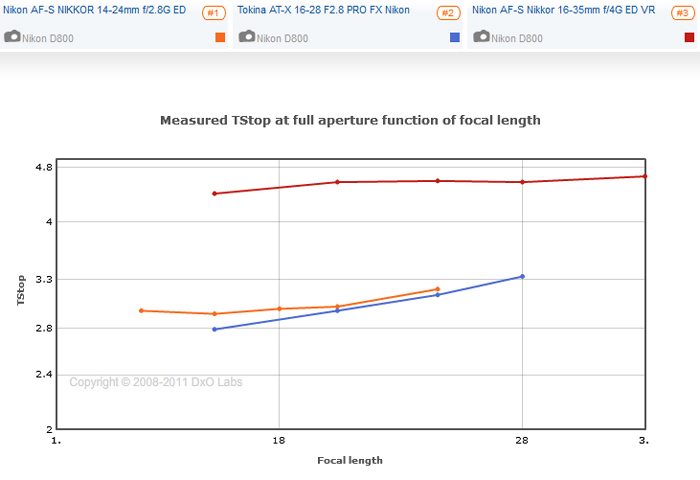 Nevertheless, the Tokina is close and at 16mm the theoretical f/2.8 aperture was measured at T2.8. Although the older AF-S Zoom-Nikkor 17-35mm f/2.8D IF-ED is highly regarded, it can’t compete with the newer lens in terms of Sharpness, Transmission or lateral Chromatic Aberration. The older lens performs quite consistently over the focal range, though sharpness across the image field isn’t particularly good. The low homogenity isn’t just noticable at maximum aperture, edge-to-edge sharpness is only achieved at f/8 and that applies to all focal lengths, not just at one end as you might think. While the older lens is a well-liked by landscape photographers for the ability to accept filters, the lower edge sharpness is rather disapointing but shows just how good the AF-S Nikkor 14-24mm f/2.8G ED really is. The AF-S Nikkor 14-24mm f/2.8G ED has high acutance across the image field, and that’s not just at full aperture, whereas the older AF-S Zoom-Nikkor 17-35mm f/2.8D IF-ED is beginning to show its age. 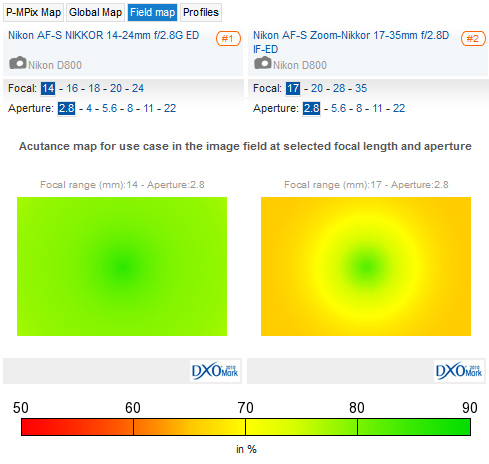 The AF-S Nikkor 14-24mm f/2.8G ED (left) has relatively low levels of lateral chromatic aberration compared to the AF-S Zoom-Nikkor 17-35mm f/2.8D ED (right). Landscape photographers may choose the earlier Nikon AF-S 17-35mm f/2.8 or the newer Nikon 16-35mm f/4 VR for their lower weight and compatibility with filters but if that extreme angle of view is required, the Nikon AF-S Nikkor 14-24mm f/2.8G ED can certainly deliver with high-resolution cameras. 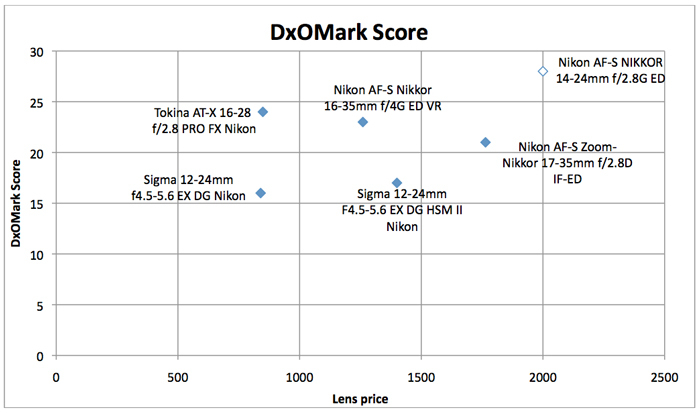 At around $1,995 it’s not cheap, but it in comparative terms the lens should be considered good value.